Fairview, Ky — Nestled in the little Kentucky town of Fairview, is the Jefferson Davis Monument State Park. It’s just off highway 68/80, between Hopkinsville and Elkton, Ky. A popular road for bikers, the southern Kentucky area is a favorite for good country back roads. and fine riding. I’ve passed by this historic monument a million times, but have never taken the time to stop for a visit. The beautiful thing about being a biker, is that you’re never in too big of a hurry that you can’t stop and see all the things you wouldn’t see if you were barreling down the interstate. The Jefferson Davis State Historic Park is one of eleven historic sites in the state of Kentucky. The park covers 19 acres and has open and covered picnic areas and a playground. Weekends will see families romping on the grounds and taking the guided elevator tours of the monument. Actually, this park is the Jefferson Davis Birthplace. His parents moved the family to Mississippi during his infancy. Jefferson Davis was the only President of the Confederate States of America. At the Visitor’s Center Museum, there are videos describing Davis’ life and the construction of the monument. The sites focal point is the 351 foot concrete tower. You could climb up the stairs until 1929 when an elevator was installed. The view from the top is gorgeous. At the top of the monument there’s an observation room with a window in each of the four walls. Whether you’re a history buff or not, when you have the chance to ride your bike and visit confederate battle grounds or burial grounds, then you owe it to yourself to do it. There’s so much history that you’ve just witnessed. 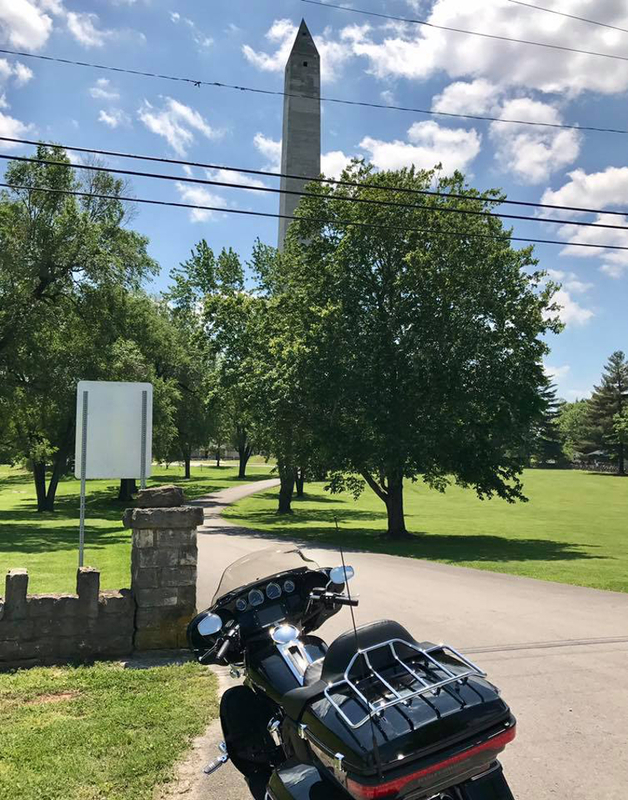 So, bikers, if you’re traveling down Interstate 24 east and get to Cadiz Ky just get off and take 68/80 and you’ll enjoy the ride and you will pass this historic monument. Or you could go the other direction and find yourself at Barkley Lodge. Either way, you’re in God’s country, and you’ve got your motorcycle.